10G SFP+ cables are of various kinds, including DACs, AOCs, and other 10G SFP+ optics (10GBASE-SR/LR/ER/ZR and 10GBAE-T copper transceivers) plus patch cables and copper cables, which are widely adopted in data centers to connect servers, storage appliance and switches. Each of them has different application for different distance. Next, we will talk about these cables respectively. 10G SFP+ DAC cable (Direct Attach Cable) is a type of sheathed high-speed cable featuring SFP connectors on either termination. 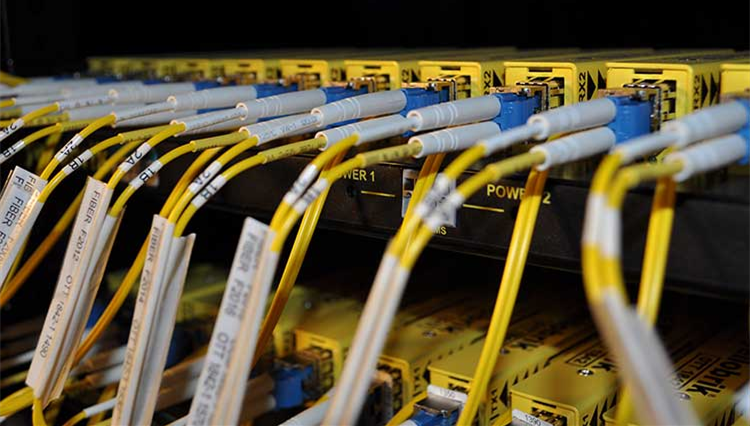 The main utility of direct attach cables lies in connecting server to switch within the rack. 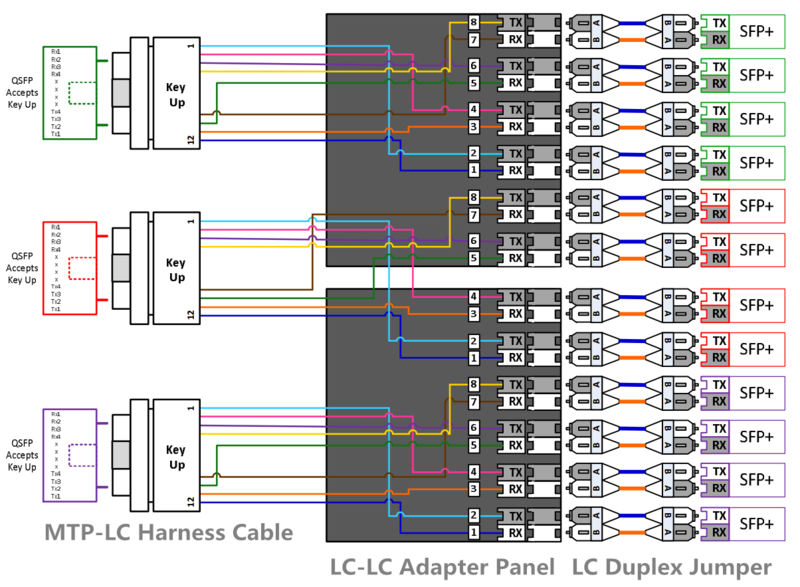 Top-rack interconnections in data centers are made of 10g direct attach cables these days to provide better alternative to RJ 45 connectors, which are losing their foothold because of the bulkier interface and availability of very few equipment and protocol appearing in their compatibility matrix. For any short range connection measuring as small as 5 m to 10 m, a better performing direct attach cable offers easier and more affordable solution. Servers are typically connected to a switch within the same racks. 10G SFP+ DAC twinax cable supports link length up to 7 m, making it perfect for servers to switch connections. FS 10G SFP+ DAC cables are available with different lengths with customized services being offered too. And every cable is individually tested on corresponding equipment such as Cisco, Arista, Juniper, Dell, Brocade and other brands, having passed the monitoring of FS intelligent quality control system. Part of the products are shown in the picture below. 10G SFP+ AOC cable (Active Optical Cable) assemblies are high performance, cost effective I/O solutions for 10G Ethernet and 10G Fibre Channel applications, which can also be used as an alternative solution to SFP+ passive and active copper cables while providing improved signal integrity, longer distances, superior electromagnetic immunity and better bit error rate performance. They allow hardware manufactures to achieve high port density, configurability and utilisation at a low cost and a reduced power budget. 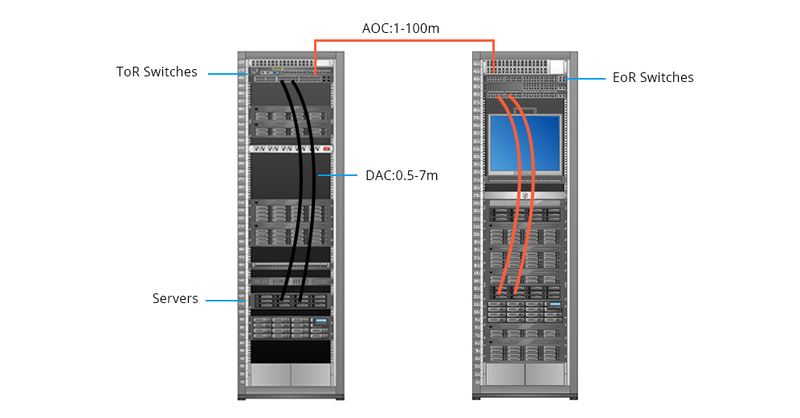 Unlike 10G SFP+ DAC cable, which is often applied in short distance, 10G SFP+ AOC cables can achieve transmission distance up to 100 m, so they often used in switch to switch connections. FS active optical cable (AOC) assemblies use active circuits to support longer distances than standard passive or active SFP+ Copper Cables. FS offers Cisco compatible AOC which is designed for high speed, short range data link via optical fiber wire. 10G SFP+ transceivers, including 10GBASE-SR/LR/ER/ZR and 10GBASE-T copper transceiver, are designed for CWDM and DWDM applications. The range of transceivers supports 850nm, 1310nm, 18 channel for CWDM applications and 40 channels for DWDM applications. 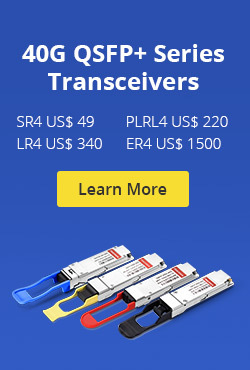 These optical transceivers are available with short haul or long haul receivers. 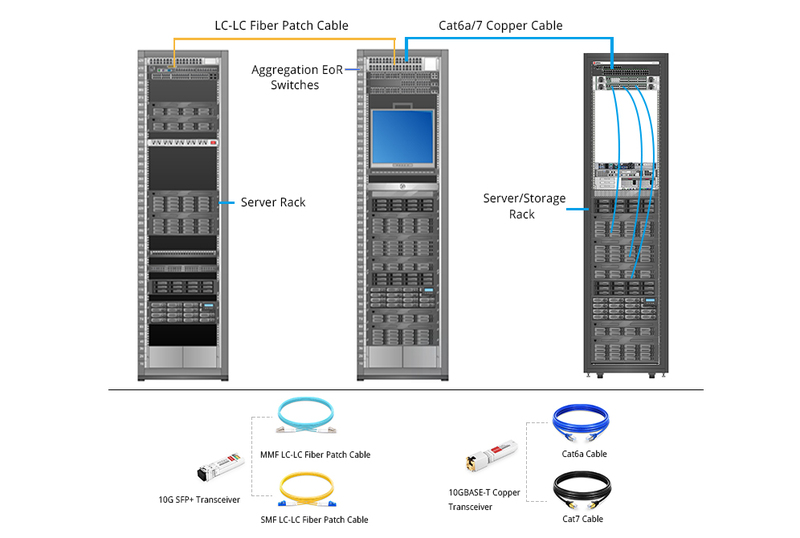 Since server or storage to switch connection requires reliable, scalable and high-speed performance, transceivers plus patch cables are usually adopted to achieve such a connection. FS 10G transceivers are of various types, including GBIC, SFP+, XFP, X2, XENPAK optics, which can be deployed in diverse networking environments. 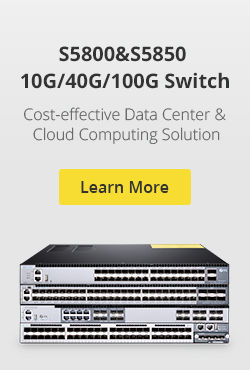 With an industry-wide compatibility and strict test program, FS 10G SFP+ modules can give customers a wide variety of 10 Gigabit Ethernet connectivity options such as server/storage to switch connectivity. Different 10G SFP+ cables are selected for different distance and application. Generally speaking, 10G SFP+ DAC cable is perfect for short reach applications within racks, while 10G SFP+ AOCs are suitable for inter-racks connections between ToR and EoR switches. With excellent quality and lifetime warranty, FS 10G optics brings real-time network intelligence to the financial services market at 10 Gbps speeds. All the products mentioned in the previous text are in stock. For more information, please visit us at www.fs.com. This entry was posted in Cabling Solutions and tagged 10G SFP+, 10G SFP+ AOC cable, 10G SFP+ Cables, 10G SFP+ DAC cable, 10G SFP+ transceivers on July 29, 2017 by Amelia.Liu. Optical transceivers are becoming smaller, but more powerful, which makes them an important piece in server technology. In fact, even though a transceiver is physically small, it can handle a network expansion or an entire install. 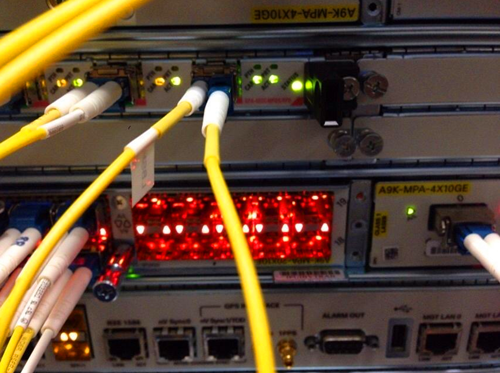 This shrinking of fiber optic transceivers allows for the improvement of servers. This reduces the overall footprint of servers and networks, which makes data centers smaller and streamlined. Optical transceivers also require lower power consumption, which means you get lower costs both in terms of design and electricity expenses. Fiber optic transceivers are always being improved, which can only mean good things for data center managers. According to recent numbers, 2016 and beyond will be huge for the data center market and optical components as more companies require efficiency in their networks. Data centers make up 65% of the overall 10G/40G/100G optical transceiver market. Shipment of 10G transceivers continue to grow, but still has plenty of room to grow, especially as industry experts expect the Datacom optical transceiver market to reach $ 2.1bn by 2019. Consumers and technology experts can expect optical transceivers to improve as data centers grow and the cloud industry expands. Manufacturers have introduced fiber optic transceivers that can transmit data at 40Gbps and 100Gbps, while some startups are investing millions in developing technology that can achieve higher speeds. These and other improvements can only mean good things for businesses and consumers. Significantly improving your company’s IT infrastructure is becoming an essential task, especially in this data-driven world. Optical transceivers and components are some of the little things that definitely can make a big difference in this effort. FS.COM provide a variety of fiber optic transceivers with high quality and low price, from 1000Base SFP to 10G SFP+, 40G QSFP+ and 100G CFP. For more information, please visit www.fs.com. This entry was posted in Transceivers Common Sense and tagged 1000Base SFP, 100G CFP, 10G SFP+, 40G QSFP+, data center, fiber optic transceivers, optical transceivers on November 12, 2015 by Alice.Gui. The enhanced small form-factor pluggable (SFP+) is an enhanced version of the SFP that supports data rates up to 16 Gbit/s. Since SFP+ is mostly used for 10G, we usually call it 10G SFP. It is a popular industry format supported by many network component vendors. In terms of the SFP+ transceivers, there are various major brands, such as Cisco, HP, Juniper etc. In the current market, the Cisco SFP+ transceivers are very popular with the customers, especially the Cisco SFP-10G-SR and SFP-10G-LR. However, these original transceiver modules are really expensive. To save cost, we usually use 3rd-party transceiver modules instead of the original brand. In this text, two kinds of compatible SFP+ modules that can severally replace the Cisco SFP-10G-SR and SFP-10G-LR will be introduced. These two kinds of compatible modules are all from the Fiberstore, the leading manufacturer and supplier of optical transceiver modules in China. Since there are many different 10GbE physical layer standards, many interfaces consist of a standard socket into which different PHY modules may be plugged. 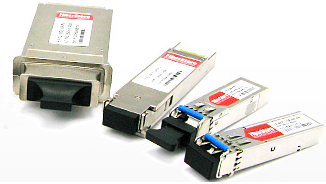 On the market, the common 10G transceiver modules are XENPAK, XPAK, X2, XFP and SFP+. XENPAK was the first MSA for 10GbE and had the largest form factor. X2 and XPAK were later competing standards with smaller form factors. XFP came after X2 and XPAK and it is also smaller. The newest module standard is SFP+. In comparison to earlier XENPAK or XFP modules, SFP+ modules leave more circuitry to be implemented on the host board instead of inside the module. Now SFP+ has become the most popular socket on 10GbE systems. For 3rd-party transceiver modules are much cheaper than the original brand (Cisco. HP, etc), they are become more and more popular in the market. As a result, suppliers to offer these effective modules are also become more than before. But in my opinion, the Fiberstore does the best among them. They provide all kinds of compatible transceivers, especially the SFP-10G85-3M-CO and SFP-10G31-10-CO, which can entirely replace the Cisco SFP-10G-SR and SFP-10G-LR. The SFP-10G85-3M-CO series multi-mode transceiver is a SFP+ module for duplex optical data communications such as 10GBASE-SR and 10GBASE-SW. This transceiver offers the same function with Cisco SFP-10G-SR and is fully compatible with Cisco devices. It is a hot-swappable input/output device, which means no need to power down if installing or replacing. Its transmission distance can up to 300m with duplex LC multi-mode Fiber cable. The SFP-10G31-10-CO single mode transceiver is a small form factor pluggable module for serial optical data communications such as IEEE 802.3ae 10GBASE-LR/LW. This transceiver offers the same function with Cisco SFP-10G-LR and is fully compatible with Cisco devices. This module is designed for single mode fiber and operates at a nominal wavelength of 1310 nm. Its transmission distance can up to 10km with duplex LC single-mode fiber. All these products offered by Fiberstore are tested in-house prior to shipping to ensure that they will arrive in perfect physical and working condition. 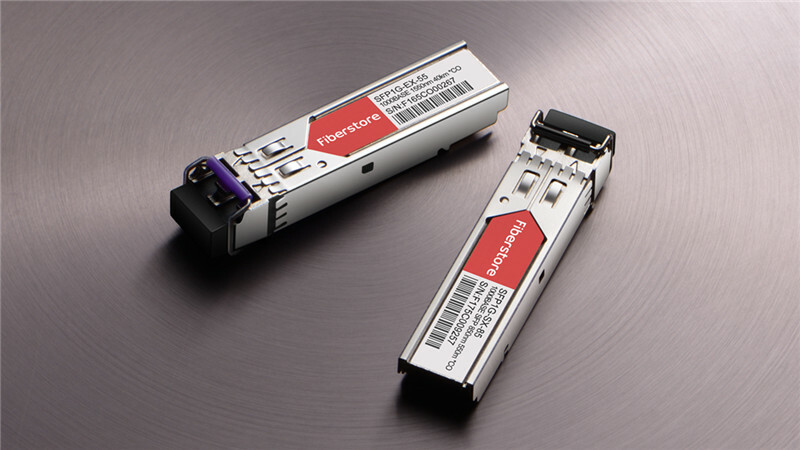 Fiberstore can guarantee these 10G SFP+ transceivers to work in your system and all of their 10G SFP+ transceivers come with a lifetime advance replacement warranty. Now they have many SFP-10G85-3M-CO and SFP-10G31-10-CO transceiver modules in stock. Therefore, Same-Day Delivery is available. If you want to know more about their products or services, please feel free to contact them at sales@fs.com. This entry was posted in SFP+ Transceiver and tagged 10G SFP+, 10G SFP+ Modules, Cisco 10G SFP+, Cisco SFP-10G-LR, Cisco sfp-10g-sr, Cisco SFP+, Cisco SFP+ Transceiver, compatible transceivers, SFP+ Transceiver Modules on June 13, 2015 by Alice.Gui. How many modules types do you know? 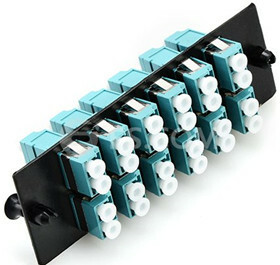 From the Fiberstore, I find this answer.The Fiber Optic Transceivers have a full range of sfp modules. Fiberstore supply various kinds of SFP module 100% compatible with Cisco SFP, HP SFP, Juniper SFP, Netgear SFP, DELL SFP, CWDM SFP, DWDM SFP, BIDI SFP, 10G SFP and so on. Next, I will give you a brief introduction on SFP module types provided by Fiberstore. The CWDM SFP (small form-factor pluggable) transceiver is really a compact optical transceiver used in optical communications for both telecommunication and data communications applications on the wavelength. CWDM SFP are used to link the ports to the fiber optic network, typical CWDM SFP like Cisco’s could support both Gigabit Ethernet and Fiber Channel. CWDM SFP transceiver modules make use of the SFP interface for connecting the equipment and use dual LC PC fiber connector interface for connecting the optical network. 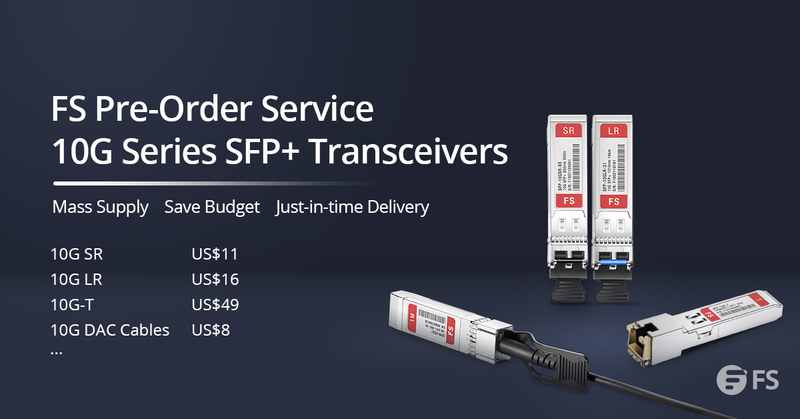 FiberStore CWDM SFP transceivers can be found with a variety of different transmitter and receiver types, allowing users to decide on the appropriate transceiver for each link to provide the required optical reach over the available optical fiber. The Dense Wavelength-Division Multiplexing (DWDM) transceivers offer DWDM transport with dramatically lower power and cost in a standard pluggable SFP package. Fiberstore DWDM SFP is available in all 100 GHz C/L-band wavelengths on the DWDM ITU grid. As multirate interfaces they support any protocol from 100 Mbps to 4.25 Gbps. The modules meet the requirements of the IEEE802.3 Gigabit Ethernet standard and ANSI Fiber Channel specifications, they are suitable for interconnections in Gigabit Ethernet and Fiber Channel environments. The DWDM SFP is designed to accept DWDM SONET/SDH (with or without FEC) for 200km links and Ethernet/Fiber Channel protocol traffic for 80km links. The 10G SFP Transceiver Modules refers to 10G SFP Plus Transceivers,someone know that the sfp+ is an enhanced version of the SFP that supports data rates up to 10 Gbit/s. Several standards for 10G SFP has been released, 10GBase-SR is for OM3 multimode optical fiber, relevant SFP plus working distance 300 meters max, 10GBase-LR is for single mode optical fiber, relevant SFP plus working distance 10km, 10GBase-LRM is for FDDI multimode fiber, the SFP plus working distance 220 meters. Want to know more SFP Module Types, pls visit fs.com, We will continue to update fiber optic transceiver information.Our optical transceivers are backed by a lifetime warranty, and you can buy with confidence. We also can customize optical transceivers to fit your specific requirements. How Much Do You Know About SONET/SDH SFP Module? This entry was posted in SFP Transceiver and tagged 10G SFP+, CWDM SFP, DWDM SFP, SFP module types, sfp modules on May 15, 2013 by Amelia.Liu.